We scrupulously and conscientiously implement quality control at each stage of manufacture i.e. testing of raw material, of intermediate states of the production process and of finished goods prior to shipping. Every batch of material that leaves our premises is checked thoroughly, to ensure that it meets all the specifications. We have modern well equipped and well developed laboratories that handle computerised spectrometer colour-matching, colour-fastness testing and other relevant activities. The record results and batch samples are preserved under optimum storage conditions, for future references. We standardize for all classes of reactive, direct and acid dyestuff. We supply dyestuff in different forms like liquid, powder and salt-free. We conduct and carry out all the relevant tests to get high quality results for food colours, food chemicals, speciality chemicals, dyes, etc. We rigorously endeavour to maintain consistently constant uniform standard of our products. Our highly qualified and experienced personnel in a furnished laboratory to match stringent standards and specifications monitors strict quality control. We strive to create innovative technologies leading to the discovery of the wonder products of Chemistry and at the same time befriending the environment. We have our up-to-date Research and Development to keep us one step ahead in competition and very close to customer expectations. 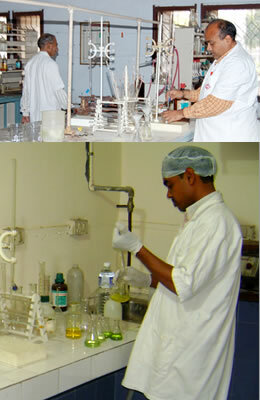 We actively promote research and development activities with vision to serve society and customers. We have modern full-fledged well equipped R&D laboratories for testing, for new product development and for constant improvement in the existing products. We are progressing in technologies and research with a view to growth and expansion not only of ourselves but also of the entire field. Our honest and constant endeavors are in progress for technology update and adding new products and molecules to serve our customers better with their added new product requirements.